NEW YORK, Nov 15, 2013/ — Opened on October 12th 2013, the new Just Cavalli flagship boutique is a big hit as it continuously attract fashion conscious New Yorkers and tourists. The new boutique, created by STAFF INTERNATIONAL, the company within Renzo Rosso’s OTB Group which has managed the Just Cavalli license since 2011 through its American STAFF USA branch, is characterized by an innovative and contemporary concept dedicated to the youthful generations who love to explore and encounter new worlds through constant research and style experimentation. With a total surface of approximately 5,650 square feet, the store is distributed on two floors and hosts the men’s and women’s ready-to-wear collections, footwear, handbags, accessories, eyewear collections, jewelry, timepieces, underwear, fragrances and smartphone and tablet cover collections which are inspired by the Just Cavalli decorative motifs. The layout of the space was carefully designed in order to emphasize the various product categories in a context inspired by metropolitan lofts. 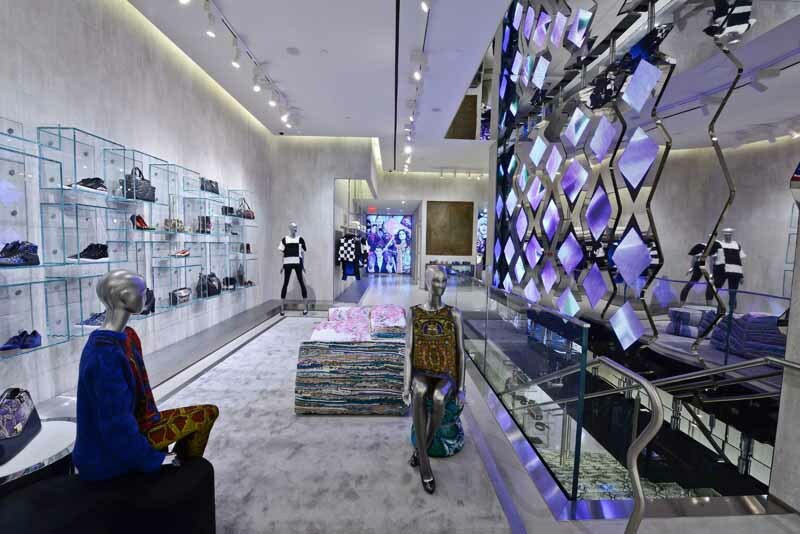 The window displays were created to offer visibility and intensity to the ambiance and are personalized with metal screens featuring the iconic python print of the Maison, while the luminous graphic scene display welcomes the clients presenting the accessories collection directly at the entrance. The two floors are connected by a suspended flight of stairs totally created in transparent glass composed by steps also featuring a python print. A 270 square-foot graphic scene video-wall composed by screens is positioned above this modern architectural sculpture and projects the iconic images which have inspired the designer’s collections. The ceiling mirror and the lustrous steel amplify the effect of this incredible kinetic image which is inspired by the graffiti of New York’s metropolitan culture. The ground floor hosts the ready-to-wear women’s collection, shoes, bags and accessories as well as a “wall display” dedicated entirely to denim. Projecting on the stairs, a bright carpet makes the descent to the lower floor even more suggestive. 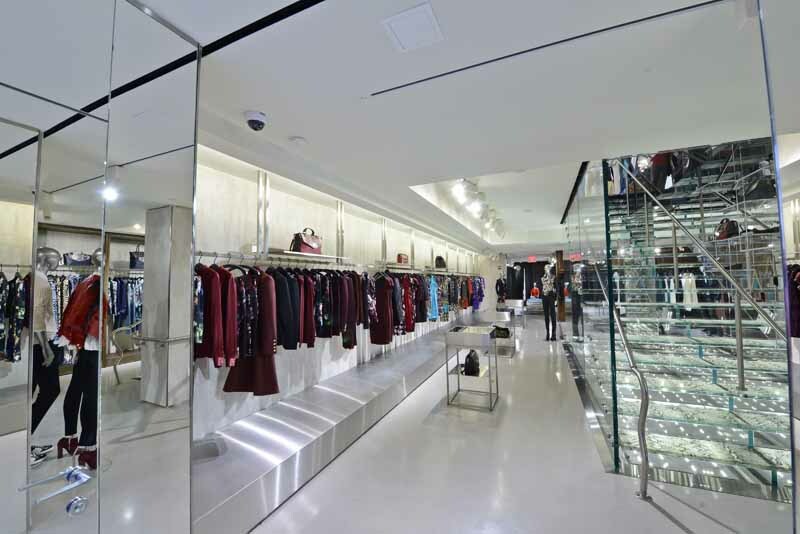 The lower floor hosts the ready-to-wear women’s and men’s collections and the related tuxedo and accessory area. The VIP room, completely dedicated to female clients, is furnished in antique wood boiseries with mother-of-pearl treatments, while large mirrors and carpets made from the iconic materials of the Just Cavalli brand complete the surroundings. The original floors were perfected with a mother-of-pearl treatment to exalt the imperfections typical of the cement flooring present in metropolitan lofts. Also the walls along the entire surface of the boutique were completed with a hand-made mother-of-pearl treatment. The collections are hung from metallic industrial fittings made from aged steel and metal, or on very light displays hanging from the ceiling. The poufs and sofas, designed personally by Roberto Cavalli, are made with Just Cavalli fabrics. The new store also has a digital soul thanks to its online store www.justcavallinyc.com: a special web platform featuring a linear and captivating design, which gives clients the possibility to virtually visit the boutique and make their purchases comfortably from home in just a few clicks.